Since the 2012 London Olympics when Team GB won 7 out of 10 gold medals in the cycling, we’ve become a nation obsessed with the sport. Enthusiasm didn’t wane when the Tour de France came to the UK- in fact; it’s fair to say that up and down the country on any given day cyclists can be seen out on our roads- and not for the purpose of commuting, but as an actual leisure activity! 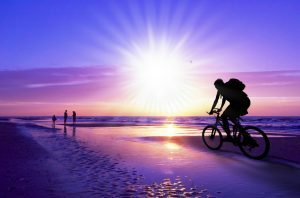 Unlike our relatively recent found passion for the sport, cycling is as synonymous with France as baguettes, berets and Breton stripes, and there’s no better way to explore the Vendee region of France than by bike. The Vendee alone has over 1150km of cycle tracks, of which 35% are dedicated cycle tracks that run separate to roads (*gasps of excitement! *), and offers 26 circuits ranging from 10km to 80km from start to finish. The cycle routes wind themselves along coastal paths, salt marsh flats, and ancient forests throughout the region, with something to suit all abilities; and after a long day of cycling, why not head back to the Chateau for a well-deserved massage, or a nice cold drink at the bar- or both, you’re on holiday after-all! The quiet country roads make cycling in the Vendee ideal for more advanced riders wanting to test their speed and endurance in the predominantly flat region. 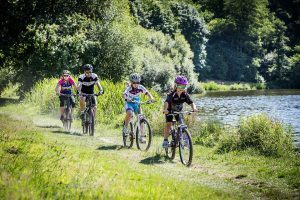 Riders who prefer off-roading will enjoy exploring the lake, woodland and salt marsh trails found throughout the Vendee, including Lac Jaunay only 3km from Chateau La Foret. The parc itself is ideal for little ones who enjoy exploring in a safe, child friendly environment. 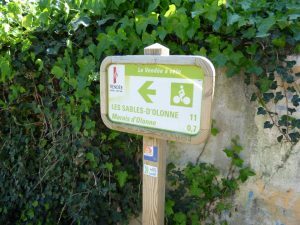 Throughout the region, riders can follow ‘Vendee Velo´ road signs to help explore trails. Alternatively contact us for your very own ‘Vendee Velo’ Guide to help you discover the routes.